What a wonderful time of the year, I know the weather hasn’t been great but the garden is bursting with produce and I feel truly grateful to mother nature and our ace team of gardeners for sowing seeds, tending the plants and harvesting baskets full of beautiful things for us to enjoy and nourish all those around us with fresh wholesome healthy food. Meanwhile I’ve started another book – can you imagine! It’s not as if the world needs another Darina Allen cookbook but still I’ve got to write this one before I hang up my apron. We still haven’t settled on a title but it goes something like this, “Forget about all those crazy diets, just grow some of your own food, bring it into the kitchen and cook it, then sit down around the table and enjoy with family and friends”. There are not too many problems and ills that can’t be solved in this way not to speak of enhancing the quality of the entire family life. Unless you have planted a potato yourself. It’s hard to describe the excitement and anticipation one feels when you dig the first of the new potato you planted months earlier. Picking them off the supermarket shelf, all scrubbed and clean doesn’t give anything like the same satisfaction plus you know exactly where they were grown and how…. Food labels are pretty selective yet none are yet required to tell you how many sprays and pesticides the crop has had but when you grow your own you know the provenance. Another bonus of growing your own is that you can get several dishes from just one vegetable take radishes for example, the fresh young leaves (as well as the radish itself) are delicious in salads and can also be cooked – they’re particularly tasty in radish leaf soup. Beets are the same, we grow three varieties, Bolthardy, Chioggia with its candy striped flesh and gorgeous Golden Globe which is just that, can you imagine a salad of these with their contrasting colour and sweet beety flavour. Again we enjoy the roots but also the stalks, just cooked simply in a little lightly salted water and tossed in olive oil. The young leaves are delicious in salads and the older ones cook down to a tender nourishing green, akin to spinach. Zucchini or courgettes are either a feast or a famine, we’ve got lots and lots at present. Delicious raw or cooked – another that gives you three options, even four if you can’t keep up with the picking. Their flavour is at best at its sweetest when they are picked between 5-6 inches in length – the larger they get the more diluted the flavour becomes but even though there are lots of good things to do with oversized courgettes its best to keep on top of the picking otherwise the plant will put all its energy into the big ones which diminishes the crop. Of course the beautiful yellow blossoms also are edible. Tear them gently apart to perk up an a green salad or stuff them to make fritters. It’s traditional to use the male zuchhini flowers rather than the female flowers which produce the zucchini. Most people are unaware that the leaves are also edible. They make a delicious and nourishing green vegetable cooked in a similar way to spinach or kale or add to a bean stew or tomato fondue. In Italy they call them Cimi di Zucca. I’d love to have any extra tips you gardeners have for the parts of the vegetables normally disregarded or what others consider to be weeds – chickweed, sheep’s tongue, sorrel, dandelions. If you can grow and cook, it’s amazing how well and cheaply you can live and how cheaply you can make delicious meals and nourish your family. look a little like mini cactus (without the prickles) and are also known as Glaswort is now in season. It is a succulent that grows in the salt marshes close to the sea and looks like tiny cactus though it’s not in the least prickly. It takes just 3-4 minutes in boiling water to cook, drain, toss in a little melted butter and serve with some wild Blackwater salmon or summer plaice for sublime seasonal treat. I’ve always loved St Anne’s Park in Dublin’s Raheny and the beautiful rose Souvenir de St Anne’s which seems to flower throughout the year. We hear terrific reports about the new Blackwater Garden Café just outside Youghal. Next time you are browsing the Garden Centre take a moment to enjoy a cup of coffee in the Café. The simple, fresh local food, is cooked by Anne McKenna – soups, sandwiches, cakes and scones. Peel the courgette or marrow, remove the seeds and cut into 2 1/2cm (1 inch) pieces. Destalk the kale or spinach. Wash and chop the leaves roughly. Keep aside. Heat the extra virgin olive oil in a wide saucepan over a medium heat. Add the cumin and mustard seeds and allow to heat up for 1 minute – the mustard seeds will pop. Add the onion, stir and fry until tender – approximately 5 minutes. Add the garlic, chilli, ginger, freshly roasted ground coriander and turmeric and stir for a further minute. Add the courgette or marrow, chopped tomatoes, vegetable stock or water. Season with salt and freshly ground black pepper. Bring to the boil then lower the heat, cover and simmer for 15 minutes. Finally, add the coconut milk, chickpeas and kale or spinach leaves. Cook until the courgette or marrow and kale (or spinach) is tender. Stir in the fresh coriander, taste, add freshly squeezed lemon juice and correct seasoning. The courgette or marrow could be replaced with butternut squash. Bring a large saucepan of water to the boil (8 pints/4 litres/20 cups), add 2 tablespoons (2 1/2 American tablespoons) salt and the penne, stir, bring back to the boil for 4 minutes. Turn off the heat, cover the saucepan tightly and allow to cook for 8-10 minutes until al dente. Strip the leaves off the beetroot, slice the stalks of the beetroot and then the stalk leaves into 1cm (1/2 inch) but keep separate. Heat the oil in a sauté pan. Add the garlic and pepper flakes, stir for a few seconds then toss in the beet stalks. Cook for 2-3 minutes, add the diced beets and leaves, stir and cook for a couple of minutes until the leaves are wilted. Drain the pasta well. Add to the pan, add the tarragon, the crumbled cheese and cream or crème fraiche. Season with lots of salt and pepper. Taste, I sometimes add a pinch of sugar depending on the sweetness of the beets. Turn into a hot bowl. Sprinkle with chopped walnuts and flat parsley. Heat the olive oil in a saucepan, add the sliced scallions, potato and zucchini dice, garlic and chilli flakes. Season with salt and freshly ground pepper. Toss and cook gently while you chop the leaves, add to the base with a handful of orso, cover with hot stock or water. Bring to the boil for 5 or 6 minutes or until the pasta, potato is cooked. Add chopped marjoram, taste and correct seasoning. Ladle into deep soup bowls and top with a slice of grilled sour dough rubbed with a clove of garlic. 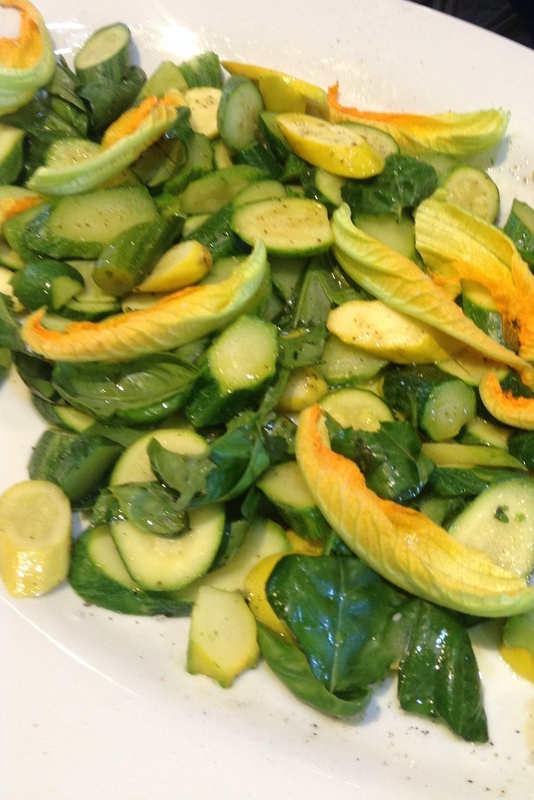 Sprinkle a few zucchini blossoms over the top, drizzle with extra virgin olive oil and serve as soon as possible. This is such a beautiful salad and made in minutes – also keeps the growing raw food affieciados happy. Make a dressing with the oils, vinegar, salt and pepper. Taste for seasoning. Just before serving, wash the radishes and beets. Shave thinly on a mandolin. Toss the lot with the parsley and dress lightly. Arrange slices of beetroot and radish overlapping haphazardly on white plates. Drizzle with a little dressing and top with a few rocket leaves and golden marjoram and chervil.